Our group first went to the Tokyo Skytree on a rainy day, so we didn’t go up to the top. 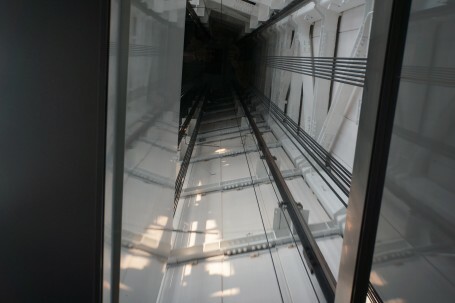 However, I was very excited to go up the second time we visited Skytree and the Solamachi shops at its base. Tokyo Skytree is a broadcasting tower standing in the Sumida area of Tokyo. It is also close to Asakusa. 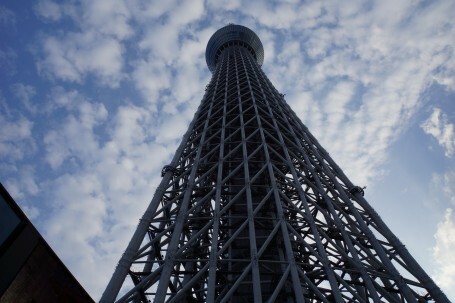 The full height is 634 meters (2,080 ft.), which makes Skytree the tallest broadcasting tower in the world. It reached its full height on March 2011, replacing the older Tokyo Tower (height 333 meters, or 1,093 ft.) as the most prominent structure in Tokyo. 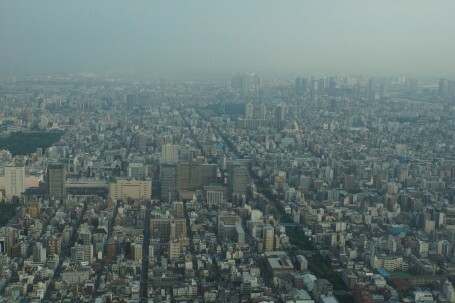 In fact, its height of 634 meters has its own meaning: the figures 6 (mu), 3 (sa), and 4 (shi) can be read together as “Musashi,” which is the name of the historic area in Tokyo where Skytree now stands. 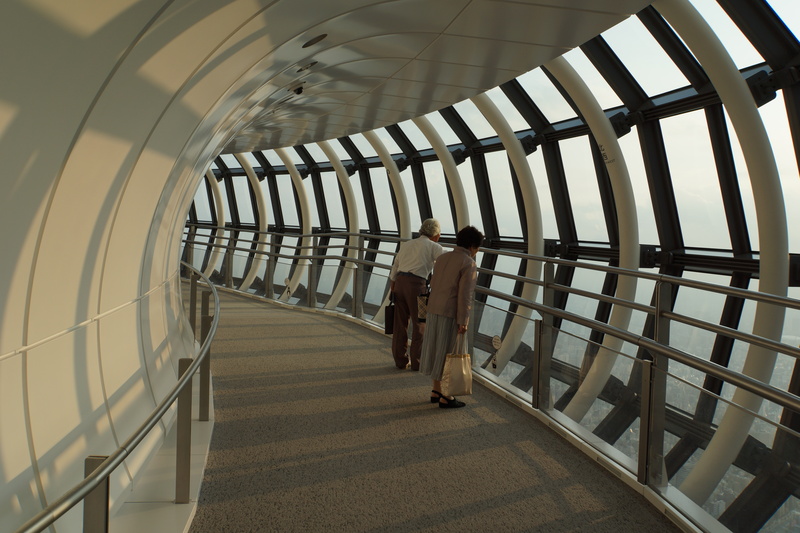 Skytree is designed to be a place where tradition and future meet. The central design concept is “the creation of city scenery transcending time: a fusion of traditional Japanese beauty and neo-futuristic design.” It even has its own color—Skytree White, which gives the structure a delicate blue glow. Solamachi, the big shopping complex sitting at the base of Skytree, is a great place for buying souvenirs, shopping, and eating. There is also a big Studio Ghibli shop. Compared to Skytree itself, Solamachi is more crowded. The fourth floor is a good choice for those planning to pick up some nice souvenirs during their visit. They have a Yomiuri Giants baseball team gift shop, fine Japanese handkerchief shops, and specialized chopstick shops, among others. For those interested in ascending to the top of Tokyo Skytree, there are two possible options. You can go to the Tembo Deck, which is at a height of 350 meters (1,148 ft). 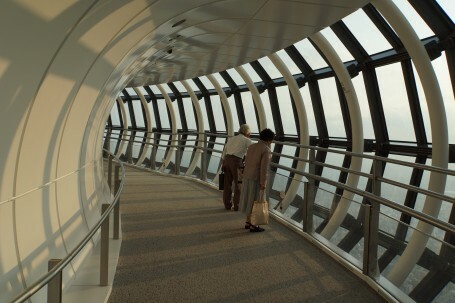 On this level, there is the Skytree Café as well as the Skytree Restaurant 634, from which you can enjoy a beautiful panorama of the Tokyo skyline. A ticket for the Tembo Deck is 2,060 Japanese yen. 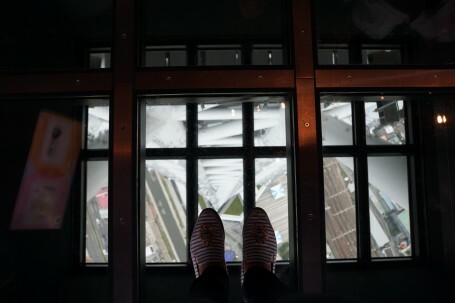 I was amazed by the view from the top of Tokyo Skytree. Once on the Tembo Deck, you can then purchase a ticket for the upper level, which is called the Tembo Galleria. This level is at a height of 450 meters (1,476 ft.). It costs another 1,030 yen to go up to this higher level. The elevator going up to the Tembo Galleria has glass walls, so you can see the outside view while the elevator is going up. I was lucky because I was the only one in the elevator when I went up to the upper level. While I wish the weather had been a little better, I was still very impressed by what I saw on my second trip to the Tokyo Skytree. It was great fun to go up to the Tembo Galleria. This entry was posted in Exploring, Tokyo, Travel by geajapan. Bookmark the permalink.